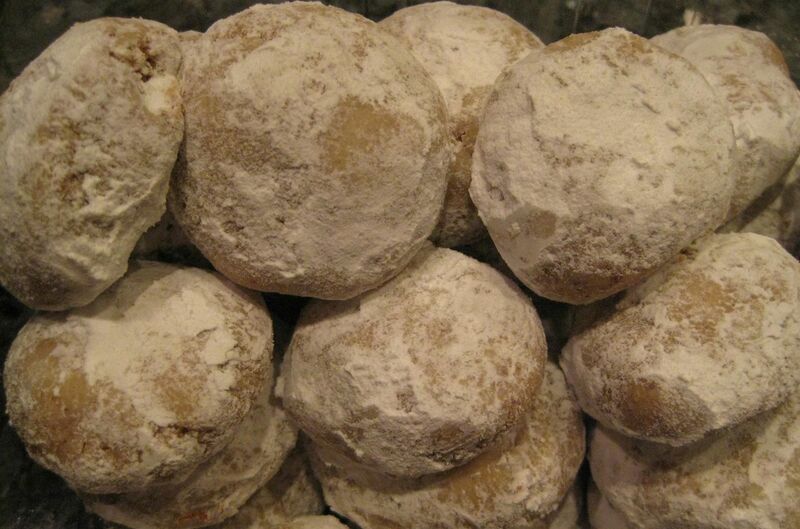 This week’s recipe for the Tuesdays with Dorie bakers is Pecan Powder Puffs. Dorie explains that these cookies are sometimes called Pecan Balls or Mexican Wedding Cakes. I’ve heard them called both, have eaten them a million times, but have never made them. Can you believe it? I can’t! Thank you Tia of Buttercream Barbie for this great selection! What I did: I made a full batch, which yields 32 small cookies. I did not add the optional cinnamon. I was a little short on pecans, so I topped off the cup with a few walnuts. How it went: If you have a food processor, these are a breeze to make. Although…I thought I’d whip these up quickly and then realized the dough needed to chill for at least two hours. Rather than breaking off small pieces with a spoon, I shaped the dough into a rectangle and then cut it into 32 pieces by cutting it into fourths and then cutting each fourth into eight pieces. That should have made 32 equally-sized cookies, but I guess I don’t cut that evenly, because they weren’t the same size! Oh well. How it tasted: Good! A simple cookie is one of my favorite things to eat, and these buttery, nutty, melt-in-your mouth cookies fit the bill. My husband, who’s not a nuts-in-baked goods kind of guy liked them a lot too. I brought most of them to work and got a lot of thumbs-up from people. Crack open your copy of Baking: From My Home to Yours to page 156, or Tia will have the recipe published today. I loved these too, and I am glad that you got to make Mexican Wedding Cookies for the first time. You are not alone-I have eaten these plenty of times, but never made them. I was a dummy this morning, thinking I was going to make these cookies at 6am. I failed to see the dough needed a good two hours in the fridge-OOPS. Guess I’ll be making these tonight and posting (hopefully) before midnight. Yours look great-I’ll bet they were melt-in-your-mouth delicious! Wow, first time making these. They are a holiday favorite to make AND eat for me. 😉 I made the cocoa ones this time, just to try something different. They were great! Those look great! It’s the kind of recipe I wouldn’t have paid attention to on my own, but now I’ll have to check it out. These are one of my favorite cookies as I love nuts! Yours look delicious! They look great. I rolled it into a log, chilled, cut into 8 and cut each of those into 4 for my 2 and that worked well…not all the same size but close enough for me and the guys! Need to make these again, and you are right, that whole FP thing makes it so easy!